Just the other day, Hugo and I remarked that it had been very quiet at base camp in regards to avalanches. In past, we might have heard 5-6 per day but we hadn’t heard any…then of course, things changed and we’d been hearing them more often. Last night was no exception. 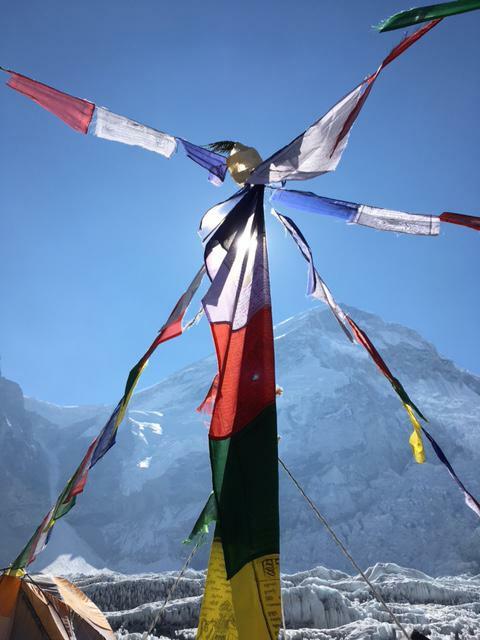 Traditionally, there have been frequent slides off Nupse, some off the West Shoulder, some off the flanks of Pumori, and some that reach the icefall route. 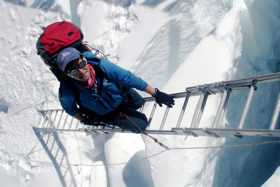 Up until last year, it was rare for a Pumori slide to reach base camp. Last year, after the earthquake, a massive slide off Pumori destroyed parts of base camp and killed many people so now any slide from Pumori brings people out of their tents. Our base camp is positioned below an ice wall to protect us from Pumori slides. Last night there was a large slide from Pumori. There was also a large slide from Nupse. The spindrift snow from that slide reached base camp and coated everything with a dusting of white. Soon after that slide, was another from higher up on Nurpse that released snow onto the icefall route. We watched the lights of climbers already up there disappear in the spindrift and then reappear. As far as we heard, no one was injured by that slide. It was about 2:30 am and we were just heading out. I awoke at 1:45 before my alarm and got dressed quickly. I always try to preserve “bed warmth” during alpine starts. Getting into my climbing layers, getting last minute items packed, and getting into the mess tent for a coffee. Sometimes I struggle with a twitchy stomach/gag reflex with alpine starts but last night was perfect. I’d decided to have digestive cookies dunked in coffee as my early morning breakfast and they went down swift and easy. I’d planned to take a sweet milk coffee “to go” in my baby Nalgene to use to keep warm while I waited for departure and to sip on getting more fluids in. That strategy also worked very well. I finished it at crampon point (where we stop to put crampons on our boots). We came close to meeting our departure time target which was fantastic given it was out first go at it on this expedition. We burned some juniper at the Puja alter and all walked through the smoke as we departed camp. Within moments, the avalanche hit the ice fall route. As I described above, we saw the head lamps disappear and then reappear-a very good sign. We kept going. Starting out is always a bit tough until your engine warms up. Trying to keep up with Karma Sherpa was challenging but I did a good job and hanging tight and not pushing too hard at the start. The early route in the icefall is a gentle slope between the ice waves and the tracks of all who’d gone before were easy to follow. Before long, we are at crampon point and I got my crampons on easily, finished my to-go coffee and Hugo encouraged to get going, so I did. We were nicely positioned in the middle-the early climbers were up ahead and we weren’t yet caught by ones coming behind. This space allowed me to find my rhythm and I was moving well on the fine line of breathing just right. I felt good. I felt confident. I was moving well. The moon, just setting, bathed the icefall in a calming light, and I enjoyed the climbing. What a treat! Just what the doctored ordered…just the boost I needed. A diamond morning for me…John Denver’s song suggests some days are diamonds, some days are stone. Mine was going great diamonds when we reached the initial steep sections of the icefall and we began to meet descending climbers and sherpas. It took awhile to understand what was happening and then it became clear through an advanced game of “telephone ” with those on the downward wave explaining that the morning’s avalanche had destroyed a portion of the route and some new ladders were needed. Suddenly, it was raining climbers and sherpas from above and we joined them. It was like the reversing falls in New Brunswick with the tide turning from up to down in an instant. I moved even better going down and was quickly back to camp. I got a hot drink and set off my Spot tracker so folks would know we were back at base camp. The rest of the team trickled in and we went back to our sleeping bags to catch a few winks and wait for the sun to warm up our world. Rumour has it that the icefall doctors have headed up to repair the route and I suspect we might try to go up again tonight but it’s early in the day (only 9 am) so I’m sure the plan will unfold. It was a great dress rehearsal for me and the rest of the team. Disappointing, of course. I’m grateful the snow came down early and not an hour later. We’ll continue to evaluate conditions, the risks, and the route while making plans and decisions. I enjoyed the morning’s romp in the icefall and am basking in being able to clearly perceive the depth of my skill and experience. I’ve just finished a bowl of ra-ra noodle soup with vegetables and I’ll try to wander about and find a wireless signal to send this. My sat phone is buried somewhere in one of the sherpa’s packs so hopefully that can be found so I can call off an update later today. This entry was posted in Everest 3.0. Bookmark the permalink.